For over 20 years, Laboratory Design & Construction has been creating high quality laboratory facilities designed to get you results. We are committed to making sure your laboratory is customized, expertly constructed, beautifully functional and will work with you for years to come. Our knowledge and expertise add value to any project, large or small. Our team of seasoned professionals and top-quality brand name representatives ensure that your vision is built to perfection. We work with your architect or end-user to create a highly functional work space customized to all of your laboratory’s needs. 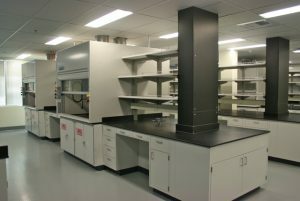 We design and build high-quality, long-lasting labs for our clients. Whether you have already developed your specifications and drawings or are starting from scratch, our team can work with you to design and develop the perfect lab within the available space you provide. Contact us today and start building the lab of your dreams. Laboratory Design & Construction is certified as a Women’s Business Enterprise (WBE) in Washington & Oregon State. We are also certified as a Woman Owned Small Business (WOSB) allowing us to work with the Federal Government.